A supreme quality Ceylon abounding with notes of Calendula, Sunflower and Rum flavors for a smooth & creamy finish. This smooth and rich flavored black tea will have you reaching for it every time. The creamy sweetness of the Calendula & Sunflower petals mixed with natural rum flavours make for the perfect drink on a cold winters day. The base tea leaves come from the most renowned tea estates in Sri Lanka. The finish of this tea is a subtle, yet satisfying silkiness that will have you going back for seconds. 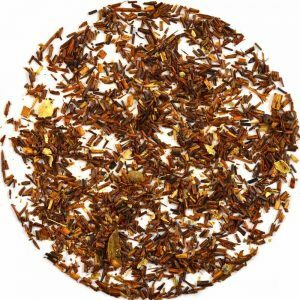 This Buttered Rum flavored black tea is delicious and a nice treat for when you are craving something sweet! To enjoy it hot, add one teaspoon of loose lea tea into your teapot for every 12 oz. (350 ml) of water. Let it steep for 2-3 minutes in 100 degrees C water. Once the tea has steeped, pour it into your mug and enjoy! To turn it up a notch, feel free to add an ounce or two of your favourite rum or liqueur to really bring out those flavours!